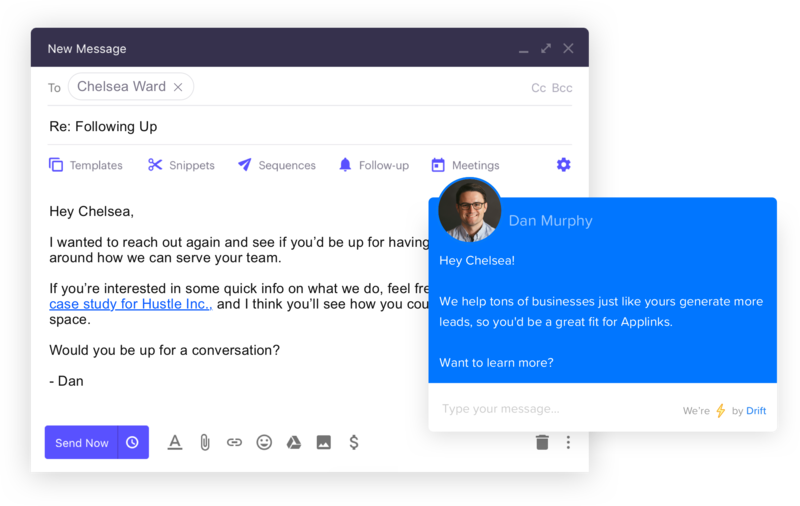 By combining Outreach and Drift, sales reps can provide an amazing buying experience by sending emails with Outreach that drive directly to Drift conversations and connect buyers with sellers immediately. Book more meetings, shorten the sales cycle, and deliver the best buying experience for your prospects today. When a prospect clicks any link to your website in your Outreach sequence, they’ll be greeted by you (yes, you!) with a personalized Drift message on your website. If you aren't around, no problem—a bot can jump in and book a meeting on your behalf. Now after chatting with a prospect in Drift, you can enroll them in an Outreach sequence directly from Drift. That way, you’ll never forget to follow up. After a prospect has clicked your link and chatted with you on Drift, see a full transcript of that conversation in your Outreach activity feed. Now you have the context you need before your next step with them. After you've chatted with your prospect on Drift, you can determine if they should stay in sequence or if another action should occur. Use Outreach triggers to customize what happens next. Admins can now manage your org's use of the integration in the Outreach org settings. Select which Drift events you want in Outreach activity feeds, and on which webpages you want the Outreach + Drift integration to work. Drift will post new conversations, prospect messages, and rep messages directly into Outreach (depending on what your admin has selected). See these messages by filtering external Drift events into your activity feed.